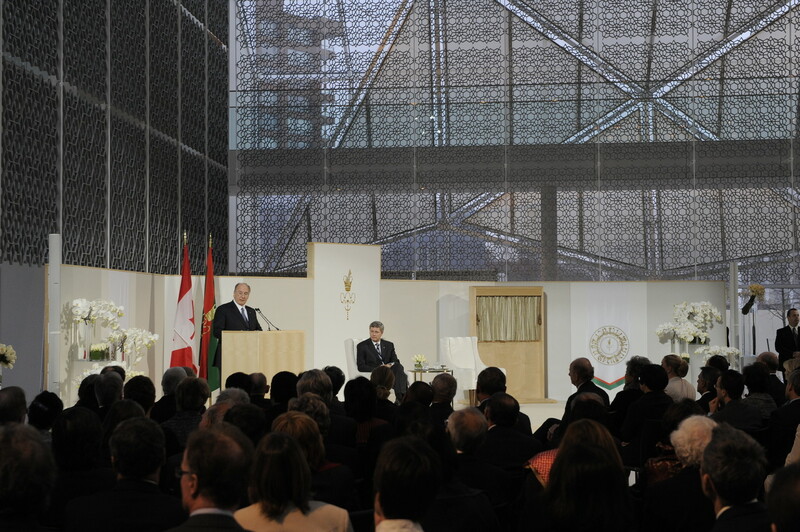 His Highness the Aga Khan, speaking at the opening ceremony of The Delegation of the Ismaili Imamat, situated on Sussex Drive in Ottawa. Looking on, in the glass-domed atrium adorned with Jali screen is the Right Honourable Stephen Harper, Prime Minister of Canada. Je voudrais commencer mes commentaires aujourd’hui en vous souhaitant la bienvenue dans le nouveau bâtiment de la Délégation de l’imamat ismaili à Ottawa. Nous sommes ravis que vous participiez à cette journée importante pour nous. My warmest thanks go out to all of you for being part of this wonderful occasion. I particularly want to thank the Prime Minister of Canada, Mr. Stephen Harper, for the honour of his presence, at a time of immense global challenges for those who bear the responsibilities of national leadership. I am also deeply grateful to the National Capital Commission and to all those who helped to design, construct and decorate this Delegation building, including all those who so generously volunteered their energies. This is the third important new Canadian building with which I will have been associated over the last five years. It affirms our intent to share, within a western setting, the best of Islamic life and heritage. This new Delegation of the Ismaili Imamat, like the Ismaili Centre and the Aga Khan Museum to be built in Toronto, reflects our conviction that buildings can do more than simply house people and programmes. They can also reflect our deepest values, as great architecture captures esoteric thought in physical form. When I invited Professor Maki, a master of form and light, to design this building, I made a suggestion to him – one that I hoped would help connect this place symbolically to the Faith of Islam. The suggestion I made focused on creating a certain mystique, centred around the beautiful mysteries of rock crystal. Why rock crystal? Because of its translucency, its multiple planes, and the fascination of its colours – all of which present themselves differently as light moves around them. The hues of rock crystal are subtle, striking and widely varied – for they can be clear or milky, white, or rose coloured, or smoky, or golden, or black. But in Islamic thought, as in this building, beauty and mystery are not separated from intellect – in fact, the reverse is true. As we use our intellect to gain new knowledge about Creation, we come to see even more profoundly the depth and breadth of its mysteries. We explore unknown regions beneath the seas - and in outer space. We reach back over hundreds of millions of years in time. Extra-ordinary fossilised geological specimens seize our imagination - palm leaves, amethyst flowers, hedgehog quartz, sea lilies, chrysanthemum and a rich panoply of shells. Indeed, these wonders are found beneath the very soil on which we tread – in every corner of the world - and they connect us with far distant epochs and environments. And the more we discover, the more we know, the more we penetrate just below the surface of our normal lives – the more our imagination staggers. Just think for example what might lie below the surfaces of celestial bodies all across the far flung reaches of our universe. What we feel, even as we learn, is an ever-renewed sense of wonder, indeed, a powerful sense of awe – and of Divine inspiration. Using rock crystal’s irridescent mystery as an inspiration for this building, does indeed provide an appropriate symbol of the Timelessness, the Power and the Mystery of Allah as the Lord of Creation. What we celebrate today can thus be seen as a new creative link between the spiritual dimensions of Islam and the cultures of the West. Even more particularly, it represents another new bridge between the peoples of Islam and the peoples of Canada. Many of you may remember that my personal involvement with Canada dates back more than three decades when, at a time of great upheaval in Uganda, many members of the Ismaili community and others found here a new home in which they could quickly re-build their lives. Under the leadership of Prime Minister Pierre Trudeau, and expressing habits of mind and spirit which have long been central to the Canadian character, this country provided a welcoming haven to those who had been victimised by history. Since that time, Ismailis from other parts of the world have also come to Canada, contributing not only to Canadian society, but also to the diverse mosaic of the global Ismaili community. One of the principal reasons, I believe, for the great rapport between the Ismaili and Canadian communities through the years is our shared commitment to a common ethical framework - and especially to the ideals of pluralism. By this I mean not only social pluralism, which embraces a diversity of ethnic and religious groups, but also pluralism in our thinking about government, and pluralism in our approach to other institutions. One of the reasons governments have failed in highly diverse settings around the world is that dogma has too often been enshrined at the price of more flexible, pluralistic approaches to political and economic challenges. Within Islam itself, we can see a broad sense of pluralism, including a variety of spiritual interpretations, and a diversity of governments and social institutions. The spirit of pluralism, at its base, is a response to the realities of diversity – a way of reconciling difference on the one hand with cooperation and common purpose on the other. It is an attitude, a way of thinking, which regards our differences not as threats but as gifts - as occasions for learning, stretching, growing - and at the same time, as occasions for appreciating anew the beauties of one’s own identity. The challenge of pluralism is particularly important for those who are called upon to lead diversified communities and to act in diversified environments. It is a challenge to which Canadians have responded nobly through the years - and it is also a challenge which has been central to our work through the Aga Khan Development Network, what we call AKDN. The AKDN’s principal focus, as you know, has been the under-served populations of Central and South Asia, Africa and the Middle East. Our approach has observed the principles of neutrality and pragmatism, but this has not always been an easy matter. Turbulence and discontinuity have characterised these regions, including the transition from colonial rule, the struggles of the Cold War, the tensions of the nuclear age, the rise of new nationalisms - of both the right and the left, as well as revolutions in communications and transportation which have so dramatically increased encounters among different peoples. Our Network has inevitably been drawn into a tangled variety of social and cultural contexts - including highly fragile, conflictual and post-conflictual situations. Our response has always been to focus on the pursuit of pluralistic progress. Even against the most daunting challenges, social and economic progress can and must be a shared experience, based on a cosmopolitan ethic and nurtured by a spirit of genuine partnership. When we have talked of development in this context over the years, we have always found responsive interlocutors in Canada. We recognise together the interdependence of economic progress on one hand and inclusive governmental structures on the other. We affirm together the centrality of communication and education in any progressive formula. We both embrace the interdependent role of various social sectors - private and governmental and voluntary - including the institutions of pluralistic civil society. For the last quarter century, Canada, especially through CIDA, has been actively collaborating with the Aga Khan Development Network to support sustainable development in marginalised communities in Africa and in Asia. In the course of this work we have seen at first hand Canadian global leadership at its best – thoughtful, empathetic and avoiding both intellectual pretensions and dogmatic simplifications. Our work together in northern Pakistan is one rich chapter in this story. Our newer efforts in places like Tajikistan and Afghanistan have opened further horizons. We could also point directly to early childhood programmes in Africa. Or we could speak of our projects in higher education, working with Canadian universities such as McMaster, McGill, University of Toronto, University of Alberta, and University of Calgary. The establishment of the Delegation of the Ismaili Imamat represents yet another step on a long path. It will give us another platform for strengthening and extending our relationship. It will be a site for robust dialogue, intellectual exchange, and the forging of new partnerships - with government, and with the institutions of civil society and the private sector of Canada and so many other countries. To be able to site this building on Confederation Boulevard, in close proximity to your major national institutions as well as representations from abroad, is itself a symbol of the outgoing, interactive spirit which must guide our response to global challenges. It is our prayer that the establishment of the Delegation will provide a strongly anchored, ever-expanding opportunity for rich collaboration - in the devoted service of ancient values, in the intelligent recognition of new realities, and in a common commitment to our shared dreams of a better world.